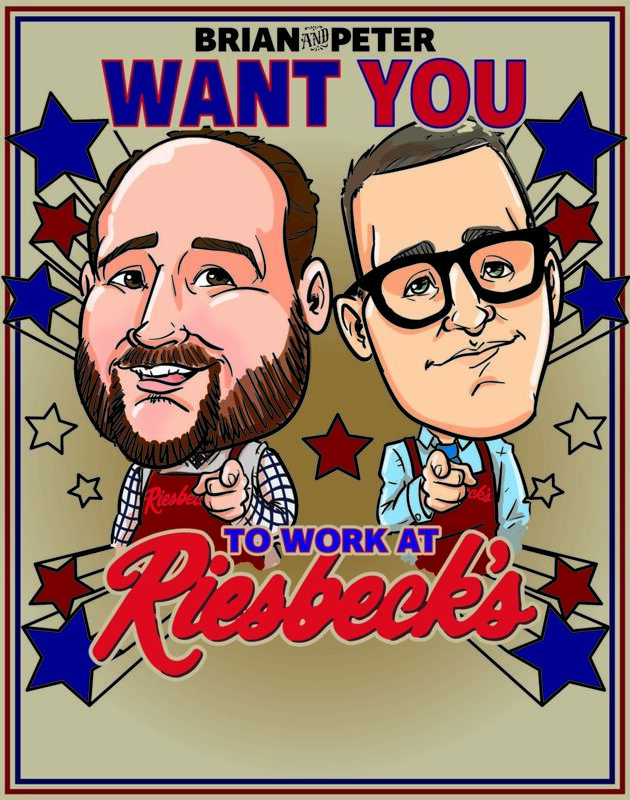 We at Riesbeck’s realize that the success of our company will ultimately rest upon our ability to satisfy the needs and desires of our customers, employees, and the communities of which we are apart. We understand that without the unselfish loyalty and dedication of our employees our goals could never be accomplished. Over 60 years ago in a Ma and Pa grocery store, our founders realized that providing excellent customer service was personally rewarding. They realized that interacting with fellow human beings is fun and providing a service to others gives a person a deep feeling of satisfaction. In addition, it became obvious that such treatment was well received by customers because they returned week after week in growing numbers. To apply, scroll down; select the "Apply" button below the position for which you wish to apply. Operate a cash register and to provide the store's customers with the most accurate and efficient checkout service possible; perform stocking. Provide assistance to customers at the check stand; provide carryout service of customers' purchases to their vehicles; perform other tasks as assigned. Observe all store rules and company policies. Greet all customers and provide them with prompt and courteous customer service. Observe shift-operating hours at all times as scheduled by department manager. Record customer purchases into a cash register efficiently and accurately by scanning or keypunching as needed. Collect currency in the form of cash or checks from customers and tender accurate change in accordance with company policies and procedures. Process all of the various types of sale transactions accepted by the store including WIC coupons, food stamps, manufacturers' coupons, gift certificates, etc., in strict accordance with established company policies and procedures including compliance with any legal requirements or regulations governing same. Assist customers with purchases including carryout service and loading into their vehicles. Gather shopping carts and take them to designated areas. Assist in stocking merchandise as requested. Assist in prompt clean up of spills and breakages to eliminate potential hazards and prevent accidents according to company policy. Maintain general housekeeping and sanitation standards in compliance with store policy; assist in keeping all checkout, sales, and storage areas clean. Hear, speak, and understand the spoken word. Frequently exert or lift up to 50 pounds. Perform other duties and assignments as requested by management. Assist in the manufacturing, packaging, and merchandising and displaying of hot and cold prepared deli foods, assist in preparation of catering items. 1. Observe all store rules and company policies. 2. Maintain a neat, well-groomed personal appearance at all times and observe company dress regulations. 3. Greet all customers and provide them with prompt and courteous service. 4. Observe shift-operating hours at all times as scheduled by department manager. 5. Assist in the production of all deli items, salads, snack trays, pizzas, and entrees. 6. Prepare party trays, catering orders, and other special orders. 7. Display merchandise in an attractive, appealing and neat manner. 8. Maintain general housekeeping and sanitation standards in compliance with store policy and state and local health regulations on an ongoing basis. 9. Comply with all safety policies and procedures. 10. Able to hear, speak, read, and write. 11. Able to add, subtract, multiply, and divide. 12. Able to exert or lift up to 50 pounds occasionally and exert or lift negligible amounts of weight often. 13. Perform other duties as requested by management. JOB FUNCTION: Effectively direct and supervise the activities of all deli personnel in the absence of the deli/food service manager to achieve the sales and profit goals established for the department. 5. Assist in ordering and maintaining inventory control to ensure freshness, product quality, and turnover for maximum sales and to minimize out-of-stocks or overstocks. 6. Be familiar with invoice documents and confirm accuracy of item descriptions, sizes, quantities, and pricing. 7. Follow approved procedures for receiving product, price marking, and restocking. 8. Keep refrigerated coolers, deli shelves, and other deli displays fully stocked and faced at all times. Display merchandise in an attractive, appealing, and neat manner. 9. Maintain general housekeeping and sanitation standards in compliance with store policy and state and local health regulations on an ongoing basis. 10. Comply with all safety policies and procedures. 11. Take action to control shrinkage and pilferage losses; observe security standards by staying alert and being aware of customer actions and behaviors; report to management any abnormal behavior. 12. Able to hear, speak, read, and write. 13. Able to add, subtract, multiply, and divide. 14. Able to exert or lift up to 50 pounds occasionally and exert or lift negligible amounts of weight often. 15. Perform other duties as requested by management. JOB FUNCTION: Effectively assist in the direction and supervision of all dairy/frozen food personnel. Maintain pricing, stocking, and rotating of merchandise in the Grocery, Frozen Food and Dairy Departments. 5. Assist in ordering and maintaining inventory control to ensure product quality and turnover for maximum sales and to minimize out-of-stocks or overstocks. 6. Keep displays and shelves well stocked and rotated. 7. Ensure that all featured items are attractively signed to attract customer attention and stimulate sales. 8. Maintain housekeeping and sanitation standards in compliance with store policy and state and local health regulations on a regular, ongoing basis. 9. Follow approved procedures for receiving and unloading of merchandise. 10. Handle damaged, out-dated and spoiled products according to company policy and assist in controlling the level of damaged goods. 12. Comply with safety policies and procedures. 13. Assist in ordering and maintaining inventory control. 14. Use correct pricing and ensure that all merchandise is properly priced. 15. Monitor temperatures and operating condition of storage areas and cases; promptly communicate any problems to management. 16. Must be able to add, subtract, multiply, and divide. 17. Be able to stock coolers and freezers and endure working under temperature extremes in refrigerated and frozen food storage areas up to 30 minutes at a time. 18. Able to lift up to 50 lbs. and push or pull wheeled vehicles weighing up to 1,000 lbs. 19. Other duties as requested by management. JOB FUNCTION: Assist in the manufacturing, packaging, and merchandising and displaying of hot and cold prepared deli foods, assist in preparation of catering items. 4. Assist customers with courtesy card applications, returned merchandise, and over charges. 5. Observe shift-operating hours at all times as scheduled by department manager. 6. Keep store management informed of pricing problem area or items that are not on file in computer. 7. By fully knowledgeable and thoroughly familiar with customer service procedures and policies. 8. Assist front-end personnel in all front end procedures. 9. Maintain general housekeeping and sanitation standards in compliance with store policy and state and local health regulations on a regular and ongoing basis. 10. Comply with safety policies and procedures. 11. Observe securing standards by staying alert and being aware of customer actions and behavior; report to management any abnormal behavior. 12. Protect company assets at all times. 13. Possess the math skills necessary to handle sales transactions and be able to troubleshoot errors or discrepancies in the customer service area and on the sales floor. 14. Operate cash registers and bag groceries as needed. 15. Able to speak, hear, read, and write. Able to communicate effectively with employees, vendors, and customers. 16. Able to occasionally lift or exert up to 50 pounds and frequently lift moderate amounts of weights. 17. Perform other duties and responsibilities as directed by management. JOB FUNCTION: Produce all bakery goods and other related products in an efficient manner within company policy. Maintain and operate the Bakery Department within company policy. 5. Prepare, produce, and merchandise product in accordance with established company or department procedures and recipes to meet sales needs. Control consistency and quality of product and maintain sanitation and production standards. 6. Control consistency and quality of product and maintain sanitation and production standards. 8. Add, subtract, multiply, and divide. 9. Lift and stack up to 50 pounds. 10. Reach and stock product up to six feet high. 11. Assist in ordering and maintaining inventory control of ingredients and supplies. 12. Train and supervise employees when directed to do so. 13. Pull or push wheeled vehicles weighing up to 500 pounds. 14. Operate all bakery equipment, bread slicers, proofers, scales, fryers, mixers, ovens, etc. 15. Package, box, price, and sell products. 16. Operate telephone and intercom. 17. Normally work a maximum eight-hour shift. 18. Provide verbal and physical assistance to customers and employees. 19. Produce, weigh, package, wrap, price, and sell product. 20. Perform freshness checks and recondition product. JOB FUNCTION:	Provide and maintain standards of patient/customer service by providing customer/patient assistance, operating cash register, answering telephone, stocking, deliver prescriptions and other items to customers/stores. 1. Observe all store rules and company rules. 2. Maintain a neat well-groomed personal appearance at all times and observe company dress regulations. 3. Greet all customer/patients and provide prompt and courteous service. 4. Record customer purchases into cash register or computer efficiently and accurately. 5. Collect currency in the form of cash or checks from customers and tender accurate change in accordance with customer policies and procedures. 6. Follow approved procedures for assisting with delivery check in and stocking of merchandise. 7. Comply with safety policies and procedures. 8. Maintain general housekeeping and sanitation standards in compliance with department policy. 9. Responsible for stocking front-end items as directed. 10. Communicate effectively with employees and customer/patients. 11. Possess the math skills necessary to handle sales transactions. 12. Occasionally lift or exert up to 50 lbs. and frequently lift moderate amounts of weights. 13. Under general supervision, perform delivery service between store location and customer’s location. 14. Operate a motor vehicle safely – Must possess a valid drivers license with a good driving record. 15. Ability to read and interpret set procedures and maps. 16. Handle Protected Health Information (PHI) and is therefore required to adhere to the Health Insurance Portability and Accountability Act (HIPAA) and the information security guidelines outlined in the Company HIPAA Compliance Manual. 17. Provide DMEPOS services and adhere to all company policy and regulatory DMEPOS guidelines for handling of Medicare eligible products and services. 18. Perform other duties and responsibilities as directed by management. JOB FUNCTION: Cut meat and prepare related product in the variety, size, quality, and trim prescribed by company and department standards. 5. Follow approved procedures for receiving, weighing, and breaking down meat products. 6. Price and display product in cases as directed by management. 7. Assist in wrapping and labeling product as required. 8. Assist in checking and verifying meat department deliveries when required. 9. Take products to refrigerated storage, freezers, shelf, and display areas. 11. Observe security standards by staying alert and being aware of customer actions and behavior. Report to management any irregularities. 12. Maintain good housekeeping and sanitation standards in compliance with store policy and state and health regulations. 13. Use and maintain equipment in good working order. 14. Able to read and write. 15. Able to add, subtract, multiply, and divide. 16. Be fully knowledgeable and familiar with all cuts and types of meat products. 17. Able to exert or lift up to 150 pounds. 18. Perform other duties and assignments as directed by management. JOB FUNCTION: Produce all bakery goods and other related products in an efficient manner within company policy. 5. Assist in receiving and unloading of merchandise to ensure quality protection, accuracy, and product rotation. 6. Assist in ordering and maintaining inventory control of ingredients and supplies. 7. Handle damaged and spoiled products according to company policy. 8. Be thoroughly familiar with the method and procedures for performing all baking tasks and with the proper operation of all bakery equipment. 9. Wrap, package, and price all products accurately in accordance with established department guidelines. 10. Decorate and merchandise cakes in an attractive, appealing, neat, and colorful manner in compliance with company guidelines. 11. Comply with safety policies. 12. Assist in training associates when assigned. 13. Maintain general housekeeping and a regular sanitizing and cleaning program that meets the standards established for the department including compliance with all state and local health regulations. 14. Use and maintain equipment in good working order. 15. Able to hear, speak, read, and write. 16. Occasionally exert or lift up to 50 pounds and frequently exert or lift negligible amounts of weight. 17. Able to add, subtract, multiply, and divide. JOB FUNCTION: Wait on customers in a courteous manner; wrap, package, and price meat and related products as prescribed by department standards. Previous meat department experience preferred. 5. Follow approved procedures for wrapping, weighing, and pricing all meats and related products processed in the meat department. 6. Keep cases and display shelves properly stocked and faced at all times to ensure maximum sales, quality, and freshness. 8. Maintain general housekeeping and sanitation standards in compliance with store policy and state and local health regulations. 9. Observe security standards by staying alert and being aware of customer actions and behavior. Report to management any abnormal behaviors. 10. Able to read, write, hear, and speak the English language. 12. Occasionally exert or lift up to 50 pounds and frequently exert or lift negligible amounts of weight. 13. Perform other duties and assignments as directed by management. JOB FUNCTION: Maintain and operate the Produce Department including the trimming and preparation of produce merchandise according to company and department standards. Assist department manager in directing and supervising other produce department personnel. 1. Greet all customers and provide them with prompt and courteous service. 2. Observe all store rules and company policies. 3. Maintain a neat, well-groomed personal appearance at all times and observe company dress regulations. 4. Observe shift-operating hours at all times as scheduled or assigned by management. 5. Responsible for performing all of the duties and job functions of an experienced produce clerk in an efficient and competent manner. 6. Be thoroughly familiar with all products carried in the department including being knowledgeable in the difference between the varieties and types of products in different produce families. 7. Follow approved procedures for receiving product, ordering product, maintaining inventory, price marking, and stocking to ensure quality protection, image, accuracy, and product rotation. 8. Assist in controlling department expenses. 9. Comply with all safety policies and procedures and ensure that all department personnel do also. 10. Maintain good communications with management and associates. 11. Maintain general housekeeping and sanitation standards in compliance with store policy and state and local health regulations. 12. Check refrigeration equipment for proper performance regularly. 13. Observe security standards by staying alert and being aware of customer actions and behavior. 14. Assist in directing and supervising other produce department personnel. 15. Able to read, write, hear, and speak. 16. Able to calculate figures and amounts such as discounts and gross margins and to apply basic concepts of algebra. 17. Able to occasionally lift or exert up to 50 pounds and able to lift moderate amounts frequently. 18. Able to work in refrigerated coolers and high moisture content preparation areas for extended periods of time. 19. Able to work in an environment with fresh fruits and vegetables without negative allergic consequences that adversely affect performance. 20. Perform other duties and assignments as directed by management. JOB FUNCTION: Maintain pricing, stocking, and rotating of merchandise in the grocery areas and perform other functions as required in an efficient manner within company policy. 5. Assist in receiving and unloading merchandise. 6. Take stock to storage or shelf areas. 7. Open cartons and price items accurately and legibly when necessary. Ensure that all product prices are properly recorded in store's scanning system. 8. Comply with safety policies and procedures. 9. Handle damaged and spoiled products according to company policy. 10. Keep store shelves and displays fully stocked, rotated, and faced at all times according to tag allocation and department standards. 11. Use correct pricing as listed in the price guide and ensure that all merchandise is properly priced. 12. Present (face) all products in assigned sections prior to leaving at the end of scheduled shift. 13. Order merchandise and maintain inventory control to minimize out-of-stocks and over-stocks and to maximize sales and turnover. 14. Maintain general housekeeping and sanitation standards in compliance with store policy and state and local health regulations on a regular, ongoing basis (backroom, sales floor, etc.). 16. Able to read, write, hear, and speak the English language. 17. Able to exert or lift up to 60 pounds and frequently exert or lift moderate weights. 18. Perform other duties and assignments as directed.